Aims: Platelet-rich fibrin (PRF) exists in both solid and fluid forms. The present study was the first to evaluate the influence of homogeneous pressure on the growth factor (GF) release in pressed PRF-matrices and plugs. Methods and Material: A solid PRF-matrix (208 g; 8 min) was pressed to obtain a plug, and a pressed PRF-matrix that are used in clinical application. The released exudates were evaluated compared to liquid PRF (60 g and 3 min). The VEGF, TGF-ß1 and EGF release was quantified using ELISA. The fibrin structure and cellular components in solid PRF groups were evaluated histologically. Results: The pressed PRF-matrix and PRF-plug exhibited denser fibrin structure compared to the non-pressed PRF-matrix. On day 7, the PRF-plug and non-pressed PRF-matrix showed significantly higher release of VEGF, TGF-ß1 and EGF compared to that of the pressed PRF-matrix. The accumulated VEGF concentration was significantly higher in the PRF-plug compared to that in the PRF-matrix and non-pressed PRF-matrix. The accumulated EGF and TGF-ß1 concentrations over 10 days showed no statistically significant differences between the evaluated solid PRF groups. The exudates released TGF-ß1 and EGF passively, that was only detectable in after 1 and 7 hours. Liquid PRF released significantly higher GFs than the exudates at all investigated time points. The early VEGF and EGF release in liquid PRF (1 hour to 1 day) was significantly higher than that in the solid PRF-matrices. On day 10, significantly higher accumulated GFs were detected in the solid PRF groups compared to those in the liquid PRF. Thus, the combination of both solid and liquid PRF is a potential tool to generate a clinically relevant system with sustained bioactivity. Conclusions: These results highlight the potential to influence the GFs release profile of solid PRF matrices by pressure and obtain a clinically applicable plug with significantly higher VEGF release, providing further understanding of the release profile of PRF matrices as a drug delivery system. In the last decades, different techniques have been developed to promote bone and soft-tissue regeneration. Natural biomaterials, such as bovine-derived xenogeneic biomaterials or allogeneic biomaterials of human origin, must undergo different purification and processing stages to eliminate pathogens and minimize the risk of disease and gene transplantation. Thus, chemical and physical purification techniques lead to the loss of the regeneration potential of the biomaterials and reduce their bioactivity. In addition, synthetic biomaterials are imitatively manufactured and do not exhibit similarity to the native tissue structure and the bioactivity of natural biomaterials. Therefore, to identify a minimally invasive autologous regeneration source, blood concentrates have been introduced as a promising clinically relevant method. Blood concentrates are generated from the patients' own peripheral blood, concentrated by centrifugation, and can release different growth factors (GFs). The first-generation blood concentrates, termed platelet-rich plasma, require multiple centrifugations and the addition of anticoagulants and external chemical activation substrates. However, this elaborate preparation may provide major drawbacks for clinical routine. Thus, the introduction of platelet-rich fibrin (PRF) facilitates the clinical application of blood concentrate systems. PRF is obtained from the patients' venous blood by single centrifugation without additional anticoagulants, making it a 100% autologous blood concentrate system. The fast and easy preparation of PRF makes this material clinically applicable and favorable for clinicians. During centrifugation, a solid-fibrin matrix is generated by the activation of the platelets through their interaction with the tube surface. The activation of platelets promotes the release of different GFs. The resulting solid PRF matrix consists of a fibrin scaffold that includes platelets, leukocytes, and plasma proteins. The preparation protocol of the first described solid PRF requires the application of a high relative centrifugation force (RCF). The role of the applied RCF and centrifugation time in the formation, structure, and bioactivity of PRF matrices has been extensively studied by our group. A recent ex vivo study reported a protocol modification by reducing the applied RCF following the so-called low-speed centrifugation concept (LSCC), resulting in a more porous fibrin matrix that contained a higher number of platelets and leukocytes compared to solid PRF prepared by using a high RCF. Further protocol adjustment to maintain the RCF and propose a reduction of the centrifugation time led to a significant increase in the release of GFs, particularly vascular endothelial GF (VEGF) measured in vitro. Moreover, reducing the RCF influenced the platelet distribution pattern throughout the matrix. The solid PRF matrix prepared using a reduced RCF showed more evenly distributed platelets compared to the accumulated platelets at the bottom of solid PRF matrices prepared using a high RCF. In addition to the solid PRF, the clinical needs for a liquid PRF required the development of a liquid PRF without additional anticoagulants. Following the LSCC, a liquid PRF rich in platelets, leukocytes, and GFs was achieved by a systematical reduction of the applied RCF and centrifugation time. The introduction of the liquid PRF widened the range of the PRF application in surgical periodontological therapy and facilitated its combination with biomaterials. In the clinical application, solid PRF is processed by pressure to obtain tailored PRF forms that are suitable for specific indications. For instance, solid PRF matrices are pressed to generate plugs that are used for socket preservation after teeth are extracted. 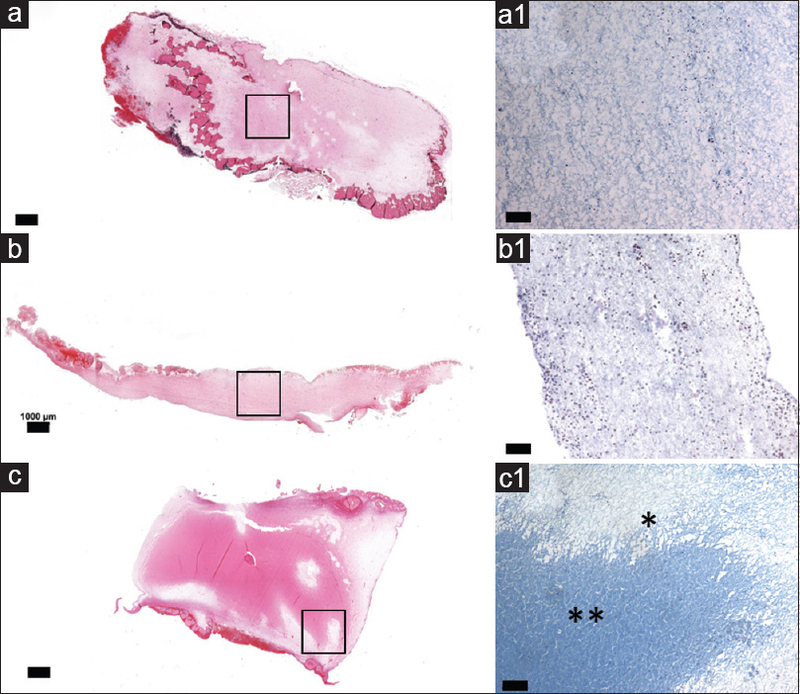 Solid-pressed PRF matrices obtained by pressing the solid PRF matrix are applied in periodontology for root coverage, in combination with biomaterials and as a wound dressing. During the pressure process, liquid exudate is released from the solid PRF matrix. To date, little is known about the influence of pressure on the GF release of pressed PRF matrix and plug and their exudates. To our knowledge, the present study is the first to evaluate the effect of a standardized preparation technique to gain pressed PRF matrix and plug compared to nonpressed PRF matrix. The aim of the present study was to analyze the effect of solid PRF matrix processing by pressure on the bioactivity, regenerative capacity, and structure of the clinically used PRF plugs and pressed PRF matrices compared to the nonpressed solid PRF matrices. In addition, the bioactivity of the released exudates was evaluated compared to that of the liquid PRF. The application of PRF in this study was in accordance with the principle of informed consent and approved by the responsible Ethics Commission of the state of Hessen, Germany (265/17). Liquid PRF matrix: 60 g 3 min. Under sterile conditions, the tubes were gently opened, and the PRF matrices were subsequently carefully retrieved from the tube and isolated from the red blood fraction without damaging the interface of the matrix. A PRF box that facilitates homogeneous pressure application was used to maintain standardized conditions during processing the PRF matrices to plugs and pressed PRF matrices. For each donor, one PRF matrix was transferred to the PRF box (PRF box, Process for PRF™, Nice, France), placed into the preformed hole and carefully compressed using the compressing tool according to the manufacturer's instructions as reported elsewhere. The resulting plug was transferred to a 6-well plate, and the released exudate was collected and transferred to a 6-well plate using a pipette. The second PRF matrix was placed on the PRF box grid and covered by the pressure tool and box cover without active pressure. After 5 min, the box was uncovered, and the pressed PRF matrix was transferred to a 6-well plate. The resulting exudate was collected and transferred to a 6-well plate. The third PRF matrix was directly placed in a 6-well plate and used as a nonpressed control [Figure 2]. The same procedure was repeated with three additional PRF matrices, and the resulting solid PRF plug, pressed PRF matrix, and nonpressed solid PRF were fixed in 4% formaldehyde for 24 h for histological analysis. The 7th tube for each donor was used for the preparation of liquid PRF. 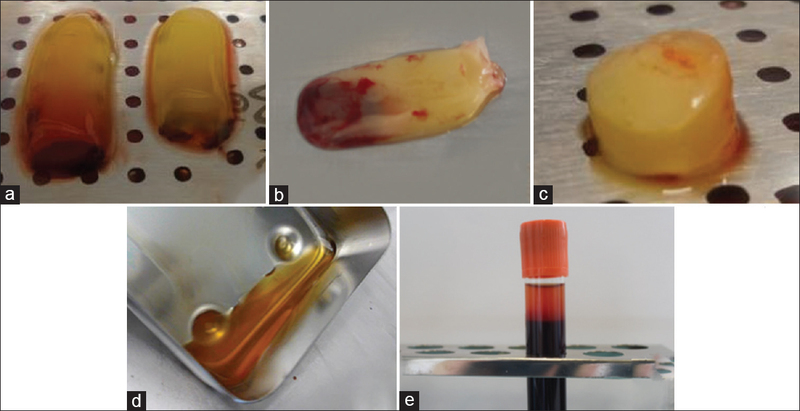 After centrifugation, the tube contained two phases: a yellow-orange upper phase (liquid-PRF) and a lower red phase (red blood fraction) [Figure 2]. Under sterile conditions, the liquid-PRF tube was carefully opened, and the upper phase was collected using a pipette. This phase was transferred to a 6-well plate and incubated at 37° for 30 min [Figure 1]. For GF release determination, the solid nonpressed PRF matrix, plug, and pressed PRF matrix were immediately covered by 5 ml of cell culture media (RPMI) supplemented with streptomycin/ampicillin antibiotics and incubated in a cell culture incubator at 37°C with CO2. Thereafter, supernatants were collected after defined time points as described below. Liquid-PRF and the exudates of the pressed PRF-matrix and plugs were first incubated for 30 min at 37°C to verify their ability of clot formation. Five milliliters of cell culture media (RPMI) supplemented with streptomycin/ampicillin antibiotics was added to the exudates. The supernatants were collected after 1 h, 7 h, and 1, 2, 7, and 10 days and stored at −80°C for GF quantification. GF concentrations of vascular epithelial GF (VEGF), transforming GF-beta1 (TGF-β1), and epidermal GF (EGF) were quantified using ELISA kits (Douset ® ELISA, R and D Systems, Minneapolis, USA) according to the manufacturer's instructions and as previously described. The assay was performed in triplicate for each donor and evaluation group. The supernatants were diluted 1:10 prior to performing the measurement for TGF-ß1 and EGF. The optical density was measured using a microplate reader (Infinite ® M200, Tecan, Grödig, Austria) set at 450 nm and corrected at 570 nm. GraphPad Prism 7 (GraphPad Software, Inc., La Jolla, USA) was used to calculate the final GF concentration. The results are expressed as the means and standard deviation. GraphPad Prism 7 (GraphPad Software, Inc., La Jolla, USA) was used to generate charts and perform statistical analyses using two-way analysis of variance with Tukey's multiple comparisons test (α =0.05). Values were considered as significant if P < 0.05 (*) and highly significant at P < 0.01 (**), P < 0.001 (***), and P < 0.0001 (****). Histological preparation was performed as previously described. Briefly, the samples were cut in transversal and sagittal directions and dehydrated in a series of alcohol with increasing concentration, treated with xylol, and rinsed in paraffin using an automated processor. Thereafter, the samples were embedded in paraffin, and four sections (3–4 μm) of each sample were cut using a rotator microtome. After deparaffinization and rehydration in xylol and alcohol, the samples were stained with hematoxylin and eosin and Azan according to established protocols as previously described. Immunohistochemical staining for CD61, as a marker for platelets, and CD45, as a marker for leukocytes, was performed as previously described. The deparaffinized slides were rinsed in a citrate buffer (pH = 6) at 96°C for 20 min. After washing and subsequent cooling, the slides were placed in an autostainer (Lab Vision™ Autostainer 360, Thermo Scientific) loaded with the CD61 antibody (Dako) at a concentration of 1:50 or CD45 antibody (Dako) at a concentration of 1:100 and UltraVision™ Quanto Detections System horseradish AEC (peroxidase 3-amino-9-ethylcarbazole) for CD61 and DAB (3,3'- diaminobenzidine techtrachloride) for CD 45. Counterstaining was performed using Hemalum. For histological evaluation, a light microscope (Nikon Eclipse 80i, Tokyo, Japan) equipped with a scanning table connected to a PC with NIS-Elements software (Nikon, Tokyo, Japan) was used, and a camera was used to obtain micrographs and total scans. Total scanning is a method to digitalize histological slides. A total scan consists of 50–100 single images automatically captured and merged to obtain a complete digitalization of the region of interest. After incubation of the liquid PRF and exudates for 30 min, structural changes were observed. Liquid PRF formed a clot. In contrast, the exudates of pressed PRF matrices and plugs did not form any clots and maintained the liquid condition. All evaluations were performed using longitudinal and transversal slices. The structure of the nonpressed solid PRF matrix showed homogeneous porous structure with a larger interfibrous space compared to the other two solid PRF groups, i.e., plug and pressed PRF matrices [Figure 3]a and [Figure 3]a1. The pressed PRF matrix showed homogeneous porosity throughout the matrix body. The fibrin structure was dense and included smaller interfibrous spaces when compared to the nonpressed PRF matrix [Figure 3]b and [Figure 3]b1. Qualitative evaluation in longitudinal and transversal sections throughout the plug showed a specific porosity pattern. The central region exhibited a rather dense fibrin structure with small interfibrous spaces. The peripheral regions showed a rather porous structure compared to the dense plug body. However, in general, the interfibrous space in the plug is smaller than that of the nonpressed PRF matrix [Figure 3]c and [Figure 3]c1. The nonpressed PRF matrix showed an even distribution of platelets (CD61-positive cells) throughout the matrix [Figure 4]a1,[Figure 4]a2,[Figure 4]a3. The dense fibrin structure in the pressed PRF matrix included accumulated platelet clusters that were distributed throughout the matrix [Figure 4]b1,[Figure 4]b2,[Figure 4]b3. The plug showed a net of accumulated platelets evenly distributed throughout the plug body over the dense and rather porous fibrin structure [Figure 4]c1,[Figure 4]c2,[Figure 4]c3. No differences between the upper, middle, or lower parts of the solid matrices were observed. The homogeneous distribution of leukocytes (CD45-positive cells) was detected in all evaluated groups. A high number of these cells were observed throughout the nonpressed PRF matrices. Throughout the pressed PRF matrix, leukocytes were entrapped within the dense fibrin structure. The plug included evenly distributed leukocytes throughout the dense and porous fibrin structure [Figure 4]. The quantified GF release was analyzed in the solid groups (solid nonpressed PRF, PRF plug, and pressed PRF matrices) and the liquid groups (liquid PRF, plug exudate, and pressed matrix exudate) for each time point as well as the accumulated release over 10 days. The initial VEGF release after 1 and 7 h was similar in all the evaluated solid groups; no statistically significant differences were observed at these time points. After 1 and 2 days, the PRF plug released a higher concentration of VEGF compared to the nonpressed PRF-matrix and the pressed PRF-matrix. However, this difference was not statistically significant. Compared to the pressed PRF matrix, the VEGF release after 7 days was significantly higher in the nonpressed PRF matrix (P < 0.01) and the PRF plug (P < 0.0001). However, no statistically significant difference was observed between the nonpressed PRF matrix and the pressed PRF plug. On day 10, similar release tendencies as day 7 were observed. However, no statistically significant difference was detected between the evaluated groups [Figure 5]a. Within the liquid groups, no VEGF was detected in the plug and pressed matrix exudates at any time point, whereas liquid PRF released significantly higher VEGF concentrations at these time points compared to the plug exudate (P < 0.0001) and the pressed matrix exudate (P < 0.0001). Starting from day 1 to day 10, no VEGF was released from the plug and pressed PRF exudates. In contrast, liquid PRF released a significantly higher VEGF concentration on days 1, 2, 7, and 10 (P < 0.0001 for all time points) [Figure 5]b. The initial GF release of the liquid PRF after 1 and 7 h was significantly higher than the nonpressed PRF matrix (P < 0.01 after 1 h and P < 0.0001 after 7 h), the pressed PRF matrix (P < 0.05 after 1 h and P < 0.001 after 7 h), and the PRF plug (P < 0.01 after 1 h and P < 0.001 after 7 h). However, with the time course, the accumulated VEGF release over 10 days was significantly higher in all solid groups compared to the liquid PRF (nonpressed PRF matrix, P < 0.0001; pressed PRF matrix, P < 0.001; and PRF plug, P < 0.0001) [Figure 5]c.
The accumulated VEGF release for the solid PRF groups showed that after 10 days, the PRF plug released significantly higher VEGF concentration compared to the nonpressed RPF matrix (P < 0.0001) and pressed PRF matrix (P < 0.0001). No statistically significant difference was detected between the nonpressed PRF matrix and the pressed PRF matrix [Figure 5]c and [Table 1]. Within the solid PRF groups, the TGF-β1 release was similar in all groups after 1 h. No statistically significant difference was observed at this time point. From 7 h to 2 days, the TGF-β1 release in the pressed PRF matrix was frequently higher than that in the nonpressed PRF matrix and the PRF plug. However, this difference was not statistically significant. On day 7, the nonpressed PRF matrix and the PRF plug released significantly higher TGF-β1 release compared to the pressed PRF matrix (P < 0.05 for both). A similar release pattern was observed on day 10; thus, the nonpressed RPF matrix and the PRF plug released significantly higher TGF-β1 compared to the pressed PRF matrix (P < 0.001 for both) [Figure 6]a. The matrix and plug exudates released low TGF-β1 concentrations only after 1 and 7 h. The plug exudate released significantly higher TGF-β1 than the matrix exudate after 1 h (P < 0.05). Liquid PRF released significantly higher TGF-β1 than the matrix exudate after 1 h (P < 0.0001) and 7 h (P < 0.0001). Similarly, the TGF-β1 was significantly higher than the plug exudate after 1 h (P < 0.0001) and 7 h (P < 0.0001). From 1 to 10 days, no TGF-β1 was detected in both exudates. However, the liquid PRF released significantly higher TGF-β1 than both exudates (P < 0.001 for days 1 and 10; P < 0.0001 for days 2 and 7) [Figure 6]b. The initial TGF-β1 release of the liquid PRF was similar to that of all solid groups. No statistically significant differences were found after 1 and 7 h.
The TGF-β1 accumulated over 10 days showed no statistically significant difference between the evaluated solid groups. These results were, however, all significantly higher than the accumulated TGF-β1 release of liquid PRF after 10 days (P < 0.0001 for all) [Figure 6]c.
The EGF release in the solid PRF matrices was higher in the pressed PRF-matrix and plug compared to that in the nonpressed PRF-matrix after 1 h. However, this difference was not statistically significant. After 7 h, the pressed PRF matrix released significantly higher EGF than the nonpressed PRF-matrix (P < 0.0001) and the pressed PRF plug (P < 0.01). After 1 and 2 days, no statistically significant difference was detected between the groups. On day 7, the nonpressed PRF-matrix released significantly higher EGF than the pressed PRF-matrix (0.05). At this time point, no statistically significant difference was found between the nonpressed PRF-matrix and the PRF plug. After 10 days, a similar release pattern to day 7 was observed. The nonpressed PRF-matrix released significantly higher EGF than the pressed PRF-matrix (P < 0.01). 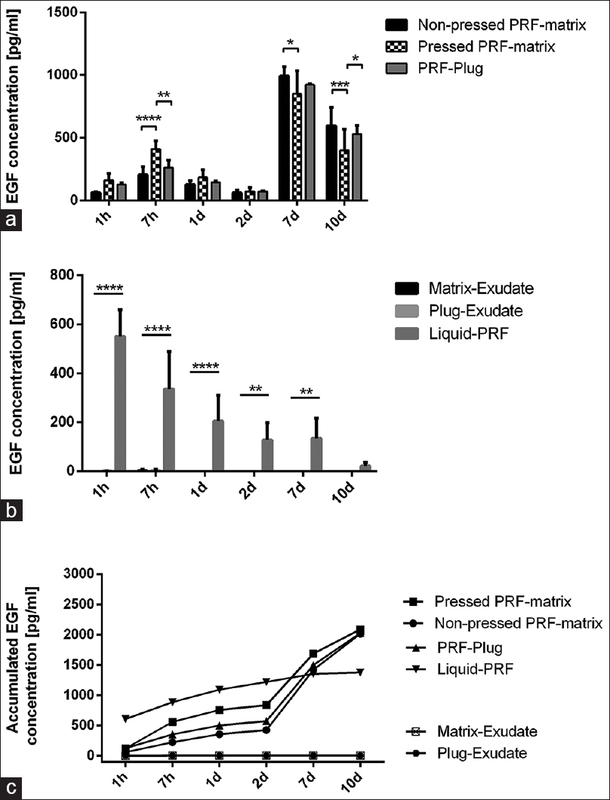 Similarly, the PRF plug released significantly higher EGF than the pressed PRF-matrix (P < 0.05). No statistically significant difference was found between the PRF plug and the nonpressed PRF-matrix [Figure 7]a. 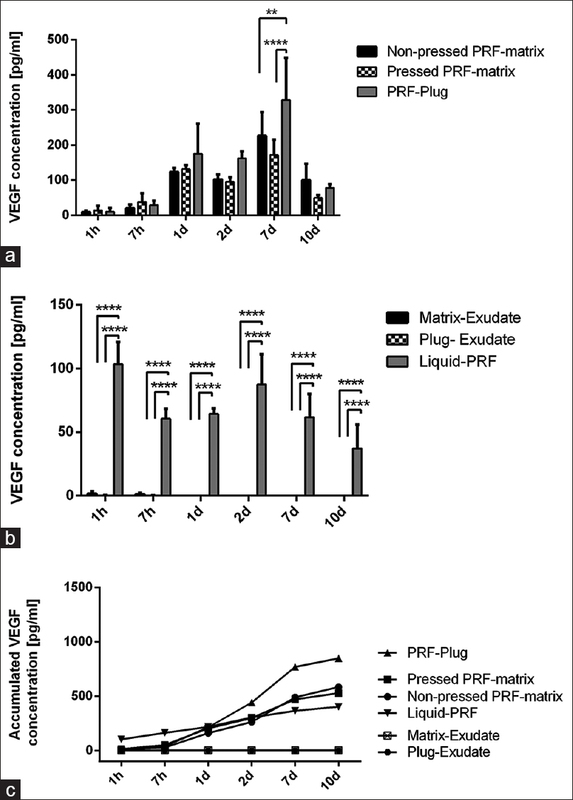 The EGF release in the plug and pressed PRF-matrix exudates was markedly low, but detectable after 1 and 7 h. At these time points, liquid PRF released significantly higher EGF than the matrix and the plug exudate (P < 0.0001 for both groups and time points). From days 1 to 10, no EGF was detected in the matrix and plug exudates. The release of EGF from liquid PRF decreased with the time course, and this difference was statistically significantly higher than the matrix and plug exudates on day 1 (P < 0.0001), day 2 (P < 0.01), and day 7 (P < 0.01). No statistically significant difference was found on day 10 [Figure 7]b. 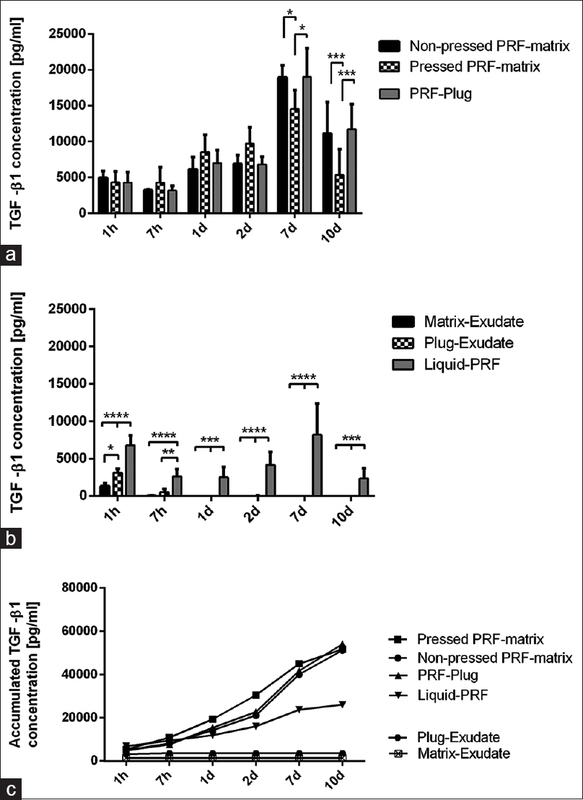 The initial EGF release after 1 h was significantly higher in the liquid PRF compared to that in the nonpressed PRF-matrix (P < 0.05), pressed PRF-matrix (P < 0.05), and PRF plug (P < 0.05). The accumulated EGF release after 7 h and 1 and 2 days was significantly higher in the liquid PRF compared to that in the nonpressed PRF-matrix (P < 0.001 for all) and the PRF plug (P < 0.01 for all), whereas no statistically significant difference was found between pressed PRF-matrix and the liquid PRF. After 7 days, no statistically significant difference was found between the evaluated groups. After 10 days, the accumulated EGF release was significantly higher in all solid PRF groups compared to that in the liquid PRF (P < 0.01 for nonpressed PRF-matrix, P < 0.001 for pressed PRF matrix, and P < 0.01 for the PRF plug). No statistically significant difference was found for the accumulated EGF release between the solid groups on day 10 [Figure 7]c.
The clinical requirements for a bioactive scaffold include a stable structure to maintain space and enable cellular migration of the host tissue, a reservoir of GFs to trigger the vascularization and regenerative cells, as well as the degradation of the scaffold in concert with the regeneration process. PRF, as a bioactive blood concentrate, is used in main indication fields in terms of tissue engineering and regenerative oral surgery. In the field of periodontal regeneration, pressed PRF-matrices are widely used for the regeneration of soft-tissue and recession coverage either alone or in combination with biomaterials. In addition, PRF plugs prepared by pressing the PRF-matrix are widely applied for socket preservation after tooth extraction. In this context, there were some concerns of whether processing PRF by pressure may damage the fibrin structure, destroy the included cells, or whether the forced elimination of the matrix exudate would lead to a loss of the GFs. A previous study demonstrated that the fibrin architecture has a major impact on the released GFs in different blood concentrate systems. Thereby, different techniques were proposed to standardize the preparation of PRF and obtain a pressed PRF matrix showing that the preparation methods of the PRF-based matrices significantly influence the structure and bioactivity of the obtained pressed PRF-matrix in terms of GF release. The ultimate aim of these devices was to obtain processed PRF matrices that are suitable for clinical application using a standardized method, enabling the preservation of the GFs within the pressed PRF-matrix or PRF plug, the retention of the platelets and leukocytes in the fibrin scaffold, and the maintenance of the three-dimensional fibrin structure., To our knowledge, no studies have evaluated the effect of a standardized preparation technique on the pressed PRF-matrix and plug compared to nonpressed PRF-matrix. In addition, there is no information about the GF release of liquid PRF compared to the PRF matrix and plug exudates. Therefore, the present study focused on the analysis of key GFs (VEGF, EGF, and TGF-ß1) in solid PRF-matrices processed by homogeneous pressure, their exudates, and liquid PRF. The histological analysis revealed that the fibrin structure in the pressed PRF matrix was denser than that of the nonpressed PRF matrix. However, the structure was homogeneous throughout the matrix and included evenly distributed leukocytes and platelets, as demonstrated by the histological analysis of longitudinal and transversal slices. This homogeneous structure is important for the clinical application of the pressed PRF matrix when used in periodontal treatment or as a wound dressing. The fibrin structure in the plug showed different porosity areas. The peripheral part was similar to the nonpressed PRF matrix, whereas the central part was denser. However, the distribution pattern of leukocytes and platelets was homogeneous throughout the plug. In a recentin vivo study, we demonstrated that a porous fibrin structure in PRF enables rapid vascularization and host cell penetration, while a dense fibrin structure is rather resistant to host cell penetration and vascularization. Translating these observations to the bone regeneration in terms of socket preservation, the peripheral porous part may trigger osteoblasts and vessels toward the central region, while the central dense structure may serve as a placeholder. The GF concentrations of the investigated solid PRF matrices showed that processing PRF matrices using homogeneous pressure does not negatively affect the release of VEGF, TGF-ß1, and EGF over 10 days. Thereby, the accumulated GF release showed no statistically significant difference between the pressed and nonpressed matrices in EGF and TGF-ß1. Interestingly, the accumulated release of VEGF was significantly higher in the pressed PRF plug compared to the pressed PRF and nonpressed PRF matrices. These different release profiles of the investigated GFs are noteworthy. Fibrin as the main scaffold of PRF matrices possesses different binding affinities to GFs. Particularly, VEGF binds to fibrin and enables slow and sustained release pattern. The compromised and dense structure of the PRF plug may have entrapped VEGF within its central region and resulted in a higher and sustained release. Another interesting finding of the present study is that on day 7, all evaluated GFs showed significantly higher release from the nonpressed PRF matrix and the PRF plug compared with that from the pressed PRF matrix. These observations are likely caused by the matrix volume and surface exposure, as the nonpressed PRF matrix and the plug have a higher volume and a less exposed surface than the pressed PRF matrix. This finding is also supported by the fact that the pressed PRF-matrix released higher EGF concentration than the other solid groups at the early time points, i.e., after 1 h or 1 day, but a significantly lower concentration on day 7. However, there were no statistically significant differences in the accumulated EGF concentrations after 10 days. This finding shows that it is possible to influence the release profile of EGF by changing the volume and structure of PRF by homogeneous pressure. EGF is involved in the process of neoangiogenesis. Enhancing the EGF concentration on early time points may accelerate wound healing by triggering cells that are essential for angiogenesis and shortening the time period of hypoxia after the intended blood vessel interruption by surgical intervention. In addition, the present study demonstrated that the GF concentrations of the evaluated solid PRF matrices were actively released, even after processing by homogeneous pressure. In contrast, the plug and pressed matrix exudates showed a passive GF release, which was only detected after 1 and 7 h for TGF-ß1 and EGF, whereas VEGF was not detected within the exudates. This effect is in concert with the observation that the exudates did not clot after incubation for 30 min. These findings suggest that the exudates of solid PRF obtained by its pressure do not include fibrinogen or platelets. Similar observations were found in anin vitro study that demonstrated no clot formation of the PRF exudate, even after the addition of bovine thrombin, which indicates a lack of platelets and fibrinogens within the PRF exudate. Thereby, the evaluation of the exudates in this study represents an indicator of the loss of GF during processing the solid PRF matrices using homogenous pressure, which is as here demonstrated practically very low. In addition, the use of the exudates in this study allowed a comparative illustration of the active and passive GF release and the relevance of platelets and leukocytes for the active GF release. However, the investigated liquid PRF showed significantly higher GF release compared to that of the plug and pressed matrix exudates. 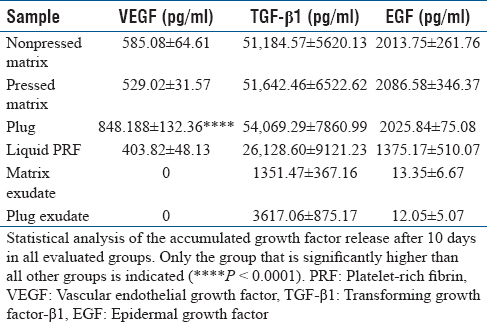 The release profile of VEGF, TGF-ß1, and EGF showed an active release over 10 days, indicating the viability of the included platelets and leukocytes. Furthermore, liquid PRF formed a clot after incubation for 30 min. Therefore, the present observation illustrates that liquid PRF releases different GFs over 10 days. This finding is complementary to the results of a previousin vitro study showing high platelet and leukocyte numbers in liquid PRF and its ability to release different GFs after 1 h. Thereby, the combination of liquid PRF with biomaterials to enhance their bioactivity is clinically more relevant than the exudate released from solid PRF matrices. However, controlled clinical studies are needed to further evaluate the clinical benefit of this system. When comparing liquid PRF with the solid PRF matrices, the present results suggest that liquid PRF releases high concentrations of GFs in the early time points, whereas solid PRF matrices release significantly higher concentrations of GFs after 10 days. This effect might be related to the quality and properties of the formed fibrin clot and its affinity to the included GFs. In addition, the volume of liquid PRF (approximately 2 ml) is less than the volume of the solid PRF matrix. Another factor is the coagulation cascade; in solid PRF, the coagulation cascade starts during centrifugation, while the coagulation of liquid PRF starts minutes after its centrifugation, thus the boost of release is measured directly after or during coagulation in the early time points after platelet activation. Platelets activation enhances their capacity to release GFs. In this context, the combination of liquid PRF and solid PRF may provide a further clinical benefit. However, controlled clinical studies are needed to further investigate this application, as it is still undetermined what concentration of a GF is needed to regenerate a specific defect size. Altogether, the results presented in the present study provide a further understanding of the clinically used solid and liquid PRF matrices. These findings can help clinicians to consciously apply PRF matrices as a drug delivery system to support regeneration in different indications. The present study demonstrated the likelihood of influencing the GF release profile in solid PRF matrices by using homogeneous pressure. The accumulated TGF-ß1 and EGF release after 10 days showed active and sustained profiles in all examined solid PRF matrices without statistically significant differences. The PRF plug released significantly higher VEGF over 10 days compared to that of the pressed PRF and nonpressed PRF matrices. In contrast to the active GF release in liquid PRF, the solid PRF exudates showed a passive GF release that was only detected in the early time points. Interestingly, liquid PRF released significantly higher GF concentrations in the early time points, i.e., 1 h–1 day, whereas the accumulated GF release over 10 days was significantly higher in the solid PRF matrices compared to that in liquid PRF. These results suggest that the combination of solid and liquid PRF may provide significant benefit for clinical application to obtain sustained bioactivity. These findings are of great interest for scientists and clinicians and provide further understanding of PRF matrices as a drug delivery system. The authors would like to thank Mrs. Verena Hoffman for her excellent technical assistance. Bottino MC, Thomas V, Schmidt G, Vohra YK, Chu TM, Kowolik MJ, et al. Recent advances in the development of GTR/GBR membranes for periodontal regeneration – A materials perspective. Dent Mater 2012;28:703-21. Ghanaati S, Barbeck M, Booms P, Lorenz J, Kirkpatrick CJ, Sader RA, et al. Potential lack of “standardized” processing techniques for production of allogeneic and xenogeneic bone blocks for application in humans. Acta Biomater 2014;10:3557-62. Dohan DM, Choukroun J, Diss A, Dohan SL, Dohan AJ, Mouhyi J, et al. Platelet-rich fibrin (PRF): A second-generation platelet concentrate. Part III: Leucocyte activation: A new feature for platelet concentrates? Oral Surg Oral Med Oral Pathol Oral Radiol Endod 2006;101:e51-5. Simonpieri A, Choukroun J, Del Corso M, Sammartino G, Dohan Ehrenfest DM. Simultaneous sinus-lift and implantation using microthreaded implants and leukocyte- and platelet-rich fibrin as sole grafting material: A six-year experience. Implant Dent 2011;20:2-12. Ghanaati S, Booms P, Orlowska A, Kubesch A, Lorenz J, Rutkowski J, et al. Advanced platelet-rich fibrin: A new concept for cell-based tissue engineering by means of inflammatory cells. J Oral Implantol 2014;40:679-89. Nurden AT. Platelets, inflammation and tissue regeneration. Thromb Haemost 2011;105 Suppl 1:S13-33. Choukroun J, Ghanaati S. Reduction of relative centrifugation force within injectable platelet-rich-fibrin (PRF) concentrates advances patients' own inflammatory cells, platelets and growth factors: The first introduction to the low speed centrifugation concept. Eur J Trauma Emerg Surg 2018;44:87-95. El Bagdadi K, Kubesch A, Yu X, Al-Maawi S, Orlowska A, Dias A, et al. Reduction of relative centrifugal forces increases growth factor release within solid platelet-rich-fibrin (PRF)-based matrices: A proof of concept of LSCC (low speed centrifugation concept). Eur J Trauma Emerg Surg 2017. Wend S, Kubesch A, Orlowska A, Al-Maawi S, Zender N, Dias A, et al. Reduction of the relative centrifugal force influences cell number and growth factor release within injectable PRF-based matrices. J Mater Sci Mater Med 2017;28:188. Temmerman A, Vandessel J, Castro A, Jacobs R, Teughels W, Pinto N, et al. The use of leucocyte and platelet-rich fibrin in socket management and ridge preservation: A split-mouth, randomized, controlled clinical trial. J Clin Periodontol 2016;43:990-9. Dohan Ehrenfest DM. How to optimize the preparation of leukocyte- and platelet-rich fibrin (L-PRF, choukroun's technique) clots and membranes: Introducing the PRF box. Oral Surg Oral Med Oral Pathol Oral Radiol Endod 2010;110:275-8. Kubesch A, Barbeck M, Al-Maawi S, Orlowska A, Booms PF, Sader RA, et al. Alow-speed centrifugation concept leads to cell accumulation and vascularization of solid platelet-rich fibrin: An experimental study in vivo. Platelets 2018;1-2. Doi: 10.1080/09537104.2018.1445835. Ghanaati S, Unger RE, Webber MJ, Barbeck M, Orth C, Kirkpatrick JA, et al. Scaffold vascularizationin vivo driven by primary human osteoblasts in concert with host inflammatory cells. Biomaterials 2011;32:8150-60. Miron RJ, Zucchelli G, Pikos MA, Salama M, Lee S, Guillemette V, et al. Use of platelet-rich fibrin in regenerative dentistry: A systematic review. Clin Oral Investig 2017;21:1913-27. Munoz F, Jiménez C, Espinoza D, Vervelle A, Beugnet J, Haidar Z, et al. Use of leukocyte and platelet-rich fibrin (L-PRF) in periodontally accelerated osteogenic orthodontics (PAOO): Clinical effects on edema and pain. J Clin Exp Dent 2016;8:e119-24. Dohan Ehrenfest DM, Bielecki T, Jimbo R, Barbé G, Del Corso M, Inchingolo F, et al. Do the fibrin architecture and leukocyte content influence the growth factor release of platelet concentrates? An evidence-based answer comparing a pure platelet-rich plasma (P-PRP) gel and a leukocyte- and platelet-rich fibrin (L-PRF). Curr Pharm Biotechnol 2012;13:1145-52. Kobayashi M, Kawase T, Horimizu M, Okuda K, Wolff LF, Yoshie H, et al. Aproposed protocol for the standardized preparation of PRF membranes for clinical use. Biologicals 2012;40:323-9. Clark RA. Fibrin is a many splendored thing. J Invest Dermatol 2003;121:xxi-xxii. Sahni A, Francis CW. Vascular endothelial growth factor binds to fibrinogen and fibrin and stimulates endothelial cell proliferation. Blood 2000;96:3772-8. Johnson NR, Wang Y. Coacervate delivery of HB-EGF accelerates healing of type 2 diabetic wounds. Wound Repair Regen 2015;23:591-600. Su CY, Kuo YP, Tseng YH, Su CH, Burnouf T.In vitro release of growth factors from platelet-rich fibrin (PRF): A proposal to optimize the clinical applications of PRF. Oral Surg Oral Med Oral Pathol Oral Radiol Endod 2009;108:56-61. Rowe SL, Lee S, Stegemann JP. Influence of thrombin concentration on the mechanical and morphological properties of cell-seeded fibrin hydrogels. Acta Biomater 2007;3:59-67.